Before I get to the tutorial, I want to point out that this assumes you already know how to stamp. If you do not, there are a lot of wonderful tutorials online. One I always like to recommend is the Getting a Good Stamp Image tutorial from soguesswhat11. Using clear nail polish, paint rectangles slightly larger than the nail. - Allow the strips to dry for a few hours. Apply desired number of base color coats. Stamp directly onto the nail for the nails you want to have the image as it appears on the stamping plate. For the nails you want the mirror image, apply a coat of clear polish and allow it to get sticky, but not completely dry. Flip the stamped nail polish strip with the stamped side down and apply it to the sticky nail, as shown above on my middle finger. Smooth out any bubbles. Using cuticle nippers, trim off the excess nail polish around the nail. If there is any nail polish remaining that needs to be removed, you can clean it further using a brush and acetone/nail polish remover. For detailed information on how to do this, you can take a look at my clean-up tutorial. Add a topcoat and you are done! I hope I have succeeded in making a clear tutorial on the technique I use. If something does not make sense, please don't hesitate to ask questions. thats an awesome idea! I dont stamp but if I did I would get aggravated with the fact that my pics werent mirrored. OH MY GOSH! THIS IS BRILLIANT!!!!!!!!!!!!!! Great tutorial! Thanks for sharing your trick with us. Congratulations for your 1000 followers! Wow!! This is so clever! I would never have thought to do this- GENIUS! This is great for mirror images, but also for those that still need serious stamp to nail practice and are impatiently wanting awesomely patterned nails! 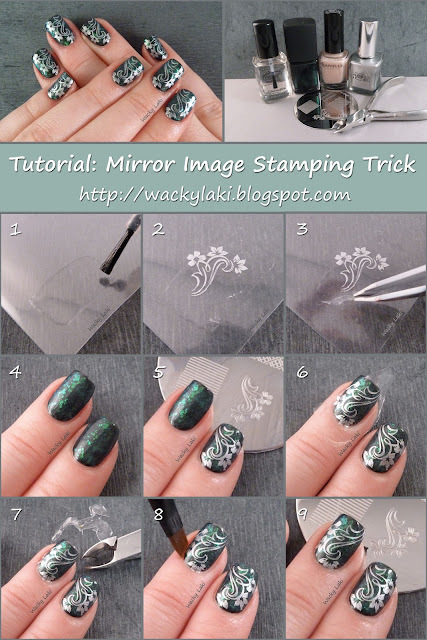 This is a great tutorial, might be good for those small stamping plates since it won't fit the whole nail maybe you could use that method to position it differently. Can't say I've ever seen this technique before! You could use this for more than stamping too. Will have to try. What a great idea! I need to give this a try. Thanks for sharing. This is Fantastic!!!! Love it!!!! Hi ! Very good idea thank you !! That's such a great idea! I can't wait to try it myself. Ohmygosh, genius! I'm trying this as soon as possible. I may even have to use this trick all the time for stamping, since I always seem to get my stamps off-center.... lol. @Katie, I'd love to see when you try it! It does work well for centering stamps too! It really depends on the polish and what I'm doing before I consider them 'dry'. I've heard of different ways of telling if they are dry such as touching two nails together, but I don't bother with any of that. I simply wait about 10-15 minues, depending on the type of polish. Jellies take longer to dry than creams/shimmer. Then I just touch them with my fingertips. Depending on what nail art I'm doing, I might need them to be more or less dry. If I'm using tape, then they need to be rock solid so that the tape doesn't lift the polish up. I often use a fast dry top coat in that case to really get them thoroughly dry to the touch. If I'm just stamping over them, then I wait until they are dry to the touch, but maybe still dentable. I find that they don't have to be rock solid for me to stamp over them. It shouldn't take 45 min for your nails to be dry. If it is taking so long, try a different top coat that is quick drying. Also try applying thinner coats of polish. For example, I often use three thin coats of polish instead of two thicker ones because I find it dries faster that way. Thick coats take a long time to dry... and I always use a quickdry topcoat when I need them really dry.